Our kitchen diner got a little Christmassy last weekend! I was gifted some truly stunning, traditional-look Christmas table accessories from Spode, to dress up in our dining area and use on Christmas day when my family descend for the annual reunion. I’m hosting for 6 of us this year, and I always enjoy getting everything planned early, starting with the table decoration. If you’re the same, I thought I’d share a few easy ways I’m achieving a warm, welcoming and elegant Christmas table this year, to really wow my family. And the best thing? It doesn’t need too much work on the day when my attention will be 100% on cooking the dinner well. Setting the table up just how I wanted it last weekend was great early practice for me. It’s given me chance to get all of last year’s Christmas table decor bits out of the loft, some that I’d forgotten I had, and make a note of what bits I needed to buy and what would be perfect for another year of Christmas cheer. I reused votive holders, candle sticks and fairy lights, and got a whole new plate set, centrepiece and glittery table runner. Having matching dinner plates and side plates makes this year’s table looks a million times more curated and carefully thought-out than my mismatched look last year. I’ve chosen these stunning Cranberry Italian dinner plates and the matching Cranberry Italian side plates by Spode. I love the festive, fair-isle charm of the collection. It’s statement and does all of the talking, allowing the rest of the table to remain simple with plenty of space for sharing dishes. If you’re a sucker for anything practical as well as traditional like me, these plates are not just pretty, they’re oven proof. Perfect for heating in the oven before serving. It’s amazing what a simple piece of faux or real foliage does to make your Christmas table feel festive… and it doesn’t have to be expensive either. Investing in a faux centrepiece will mean you have it for years to come, or if you like to vary it year on year, pick up seasonal foliage, or eucalyptus to scatter down the center. Shamelessly all the years before now I always served gravy to my family in the same measuring jug I’d mixed the OXO in. I always wanted a fancy gravy boat that felt special to pour from, rather than the jug I made my scrambled eggs in every morning! So, when Spode’s Winter Scene Gravy Boat turned up, I felt so proud to put it on my table. It’s well worth investing in sharing dishes too. 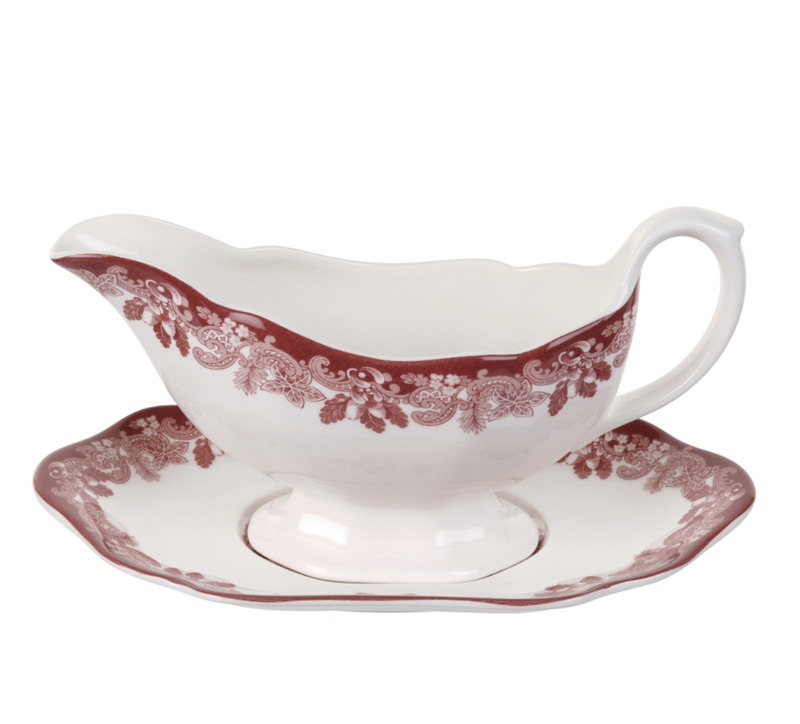 This Cranberry Italian Serving dish is the perfect size for our fairly narrow table. It sits neatly in one corner, it will easily fit enough carrots, sprouts and extra roasties in for 6 people and the handles make it easily passed from guest to guest. It’s the little things! As much as I adore our dining table bench, it isn’t the most practical seating for hosting. It gets hard to sit on any longer than an hour or two, and when the wine’s flowing and the crackers are pulling, you want your guests to feel really comfortable. To create a hygge Christmas table decor look while softening the bench for guests, I threw our faux rug and cushions over it. If you’ve got hard seated chairs it’s well worth bringing in some cushions and throws for the seats and the backs of your chairs. Little things like this always mean a lot to older members of the family who might need a bit more height in their chair too. 6. Need a quick table setting idea? Pick a sprig of rosemary! I saw this idea on Pinterest and tagged it on my Christmas Table Decor board. I’ve only just realised that rosemary is such a Christmassy looking herb. Cut a few inches off your plant and place it beside your guest’s napkins, or wind it in a circle to make a napkin ring, and it’ll bring such a sweet, fresh, festive touch to your Christmas table. The really keen guests can use it to garnish their roasties. When you think of a hygge Christmas table, it’s the twinkling lights and flicker of candles that set the scene against some stunning patterned crockery, furs and antler candlesticks. For my Christmas table I love the look of layered light at diferent heights on a table so I’ve got a mix of high, tapered dinner candles and low votives. For the surrounding area like windowsills, sideboards etc. I’m using fairy lights and a pre-lit garlands to bring that much coveted festive ambience. Collaborative post. All words, opinions and products chosen, my own.